This month we will focus on Network optimization. This is a very broad topic to cover so I will only cover a few of the areas that we see the most concerns with. There are many technologies that can offer you optimization in your network, starting with your network infrastructure. Routers and switches are the core devices on your network that allow communication of your hardware components. Do you use managed switches, unmanaged, or a mix? For the managed switches that you are using, have they been optimized for the best data communication, or are they just installed in your panel with zero configuration, which makes them just a very expensive unmanaged switching device? There are a few basic settings that can be configured on your network switches to allow for a big increase in optimization on the network. These include enabling features like IGMP snooping to suppress multicasting traffic on the network and enabling spanning tree protocol to protect or ensure that your network loops are going to operate correctly; also, enabling and using VLAN’s to lower the size of broadcast domains and secure device communications. These few items can make a large impact on your network communications. Using managed switches allows for many advanced features as well as provides for detailed troubleshooting to be performed where an unmanaged switch is not available. Selecting the correct hardware is essential to have optimal data communications and to ensure you don’t have networking issues that you can’t troubleshoot or that could be very difficult and time consuming to trace. 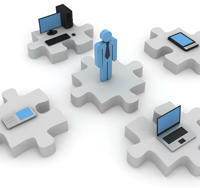 Another area for network and system optimization is with virtualization. It has taken a few years for this technology to catch on in the Industrial IT arena, but it is here and it can provide optimizations in your hardware, as well as allow for high availability and redundancy in your systems with less hardware than many have used in the past. Virtualization for server hardware allows for multiple servers to be fully redundant on as little as two physical hardware servers (known as “hosts” in the virtual world). Features like high availability and fault tolerance can provide industrial plants big benefits with redundancy and uptime as well as provide for scheduled maintenance downtimes without ever having to take the plant software offline. The ability to gain these features with less costs due to lowering the hardware requirements is a win-win for Industrial networks. The last area I will cover in this post for network optimization is the use of a remote desktop server and thin client technologies. Revere is an ACP thinmanager systems integrator, and we can’t say enough good things about the technology and thin client solutions that they provide. Thin clients on the plant floor allow for cheap and quick replacements of plant floor computers since a thin client is only a low end piece of hardware that allows a connection back to a server session where all of the computing is taking place. The ability for any operator in the plant to swap out a dead thin client and reconnect that portion of the line in minutes vs. days with a traditional computer system replacement cycle is very beneficial to Industrial plants. With thin client technology, you can also secure areas of the plant easily. And with ACP thinmanagers’ Relevance product you can have mobilization, allowing plant operators to get detailed data for the area of the plant that they are located in on a mobile device, as well as be able to auto log out the user for security purposes once they leave that particular area. As mentioned, these are just three areas where Revere is seeing the largest technology changes with our customers and areas that you can look at to gain further optimizations in your plant infrastructure. We will be happy to discuss these areas with you in more detail if you would like more information or to see how any or all of these optimizations would fit into your plant networks.